Description One of the most popular of the hot-tasting spices is ginger, which is obtained from the root of Zingiber officinale. The plant is indigenous to southern China, from whence it is spread to the Spice Islands and other parts of Asia, and subsequently to West Africa and to the Caribbean. India is now the main producer and exporter. Extracts of ginger are used in foods, condiments, baked confections, candies, beverages, cosmetics and perfumes. It is common to find it in many supermarkets for use in food preparation or as an herbal medicine. China produces a ginger which is particularly suited for confectionery, whereas Japanese ginger lacks the typical aroma. Pickled ginger (gari or sushoga) is always used as a condiment for sushi. Overall, ginger products vary considerably in taste, pungency and smell, while the root varies in consistency, depending on the country of origin and the variety of the crop. See a list of spices by Taste and Hotness. Useful Parts The rhizome contains the spicy parts. Medicinal Properties The main constituents in ginger are phenolic compounds such as gingerols and shogaols, and sesquiterpenes such as zingiberene. These and other compounds are extracts found in ginger oleoresin. 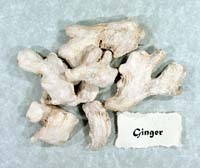 The main pungent flavor chemicals are the gingerols, which are not volatile. Recently, studies have suggested it is of value as an anti-emetic; however, it should probably not be used in nausea of pregnancy, since its safety has not been established. There is less convincing evidence to support claims that ginger is an antioxidant, with cancer preventing properties, or that it has anti-inflammatory benefits in arthritis. In large amounts, it appears to inhibit platelet aggregation. 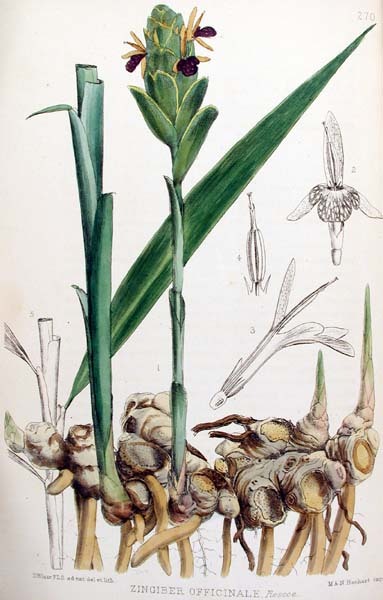 Historical View "Traditionally, the warming and aromatic properties of ginger led to its use for numerous indications. It is a digestant and carminative, and was used for dyspepsia and bowel colic. It is a general stimulant, being one of many spices that are regarded as being aphrodisiacs. Ginger has been recommended as an expectorant and it is traditionally used in teas or soups to treat colds or bronchitis. 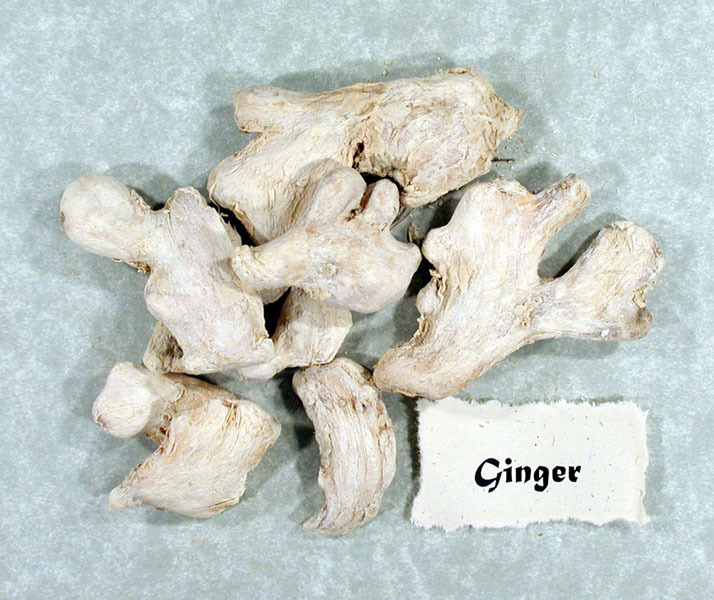 Many traditional Chinese medicines contain ginger, and its use generally appears to be safe.